This post was written as part of a term-long project called Unheard Voices. We had to deliver a creative response to highlight an unknown designer who has had an impact on the world. 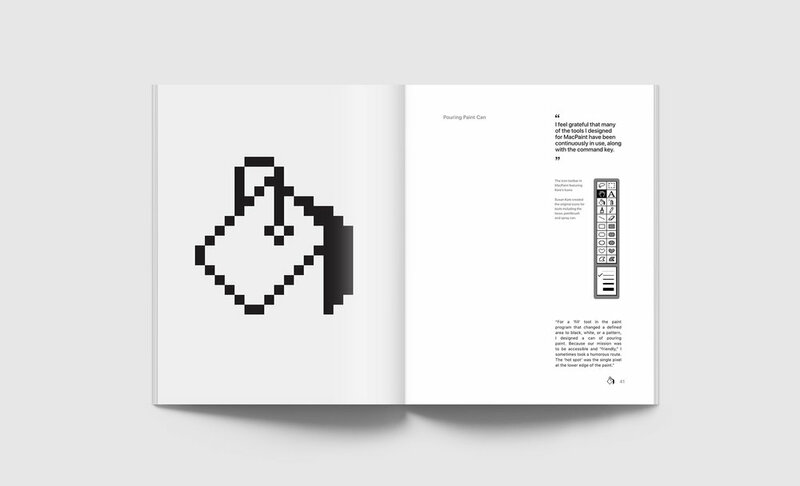 I chose Susan Kare, who was hired by Apple in 1982 and designed almost all of the icons, fonts, illustrations and user interface for the original Macintosh. She created icons such as the ‘save’ floppy disk and ‘trash’ can yet most people have never heard of her. For several weeks I struggled to find an idea for what I could create for this project. 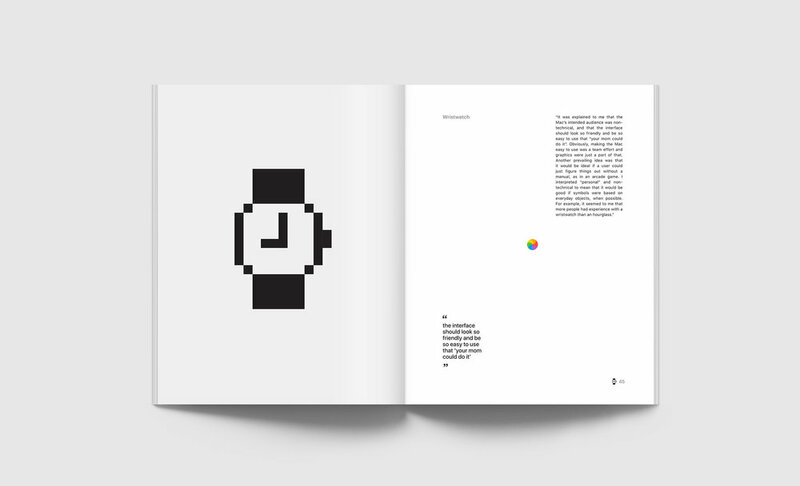 I experimented with the idea of creating physical versions of her 1984 Macintosh icons, creating exhibition style posters, an app and all sorts of other things. I realised later on in the project that it was the stories behind her icons that I loved, not the technicalities of the icons themselves. I wanted to find a way to tell the stories and showcase her work so people could see what an impact she had on the world. 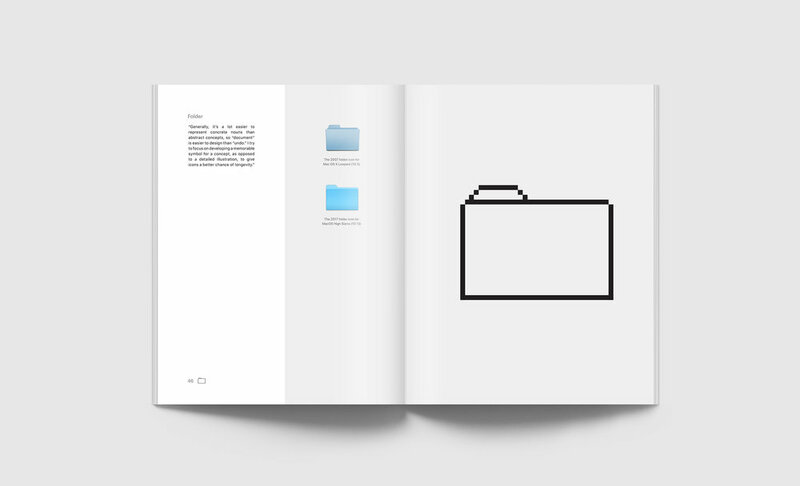 In the final week of the project I decided to create a high-end publication that would be a collection of articles, stories, archival photography and icons about Susan Kare. As I had spent most of the project time experimenting, reading about Kare and looking at her icons, I had a lot of knowledge and information to include in the publication; so this task was really about designing successful page layouts and curating the best articles and interviews. I started by talking to 2 technicians, Lizzie and Sharon, at my universities print finishing department. I wanted the publication to have a higher end; more premium feel so we discussed paper stocks and binding methods. We concluded that the best binding approach would be to have the publication perfect bound. This involves a strip of glue along the spine that binds the pages together and is used for books and thick magazines such as Vogue. There needs to be at least 40 pages to ensure there is enough space for the glue to stick to the pages so I aimed for my publication to be around 50 pages. I also chose the dimensions of the leaf pages which would be 271x210. This is the same width as A4 however slightly less tall, allowing for a more bespoke, considered look. I chose these dimensions as it is smaller than A4 allowing it to be easily printed on A4 sheets. I experimented with a sheet of paper, folding bits off the top until I had a size I liked. Now that I had the technical specifications sorted I started to plan the layout and split the publication into 3 key sections. 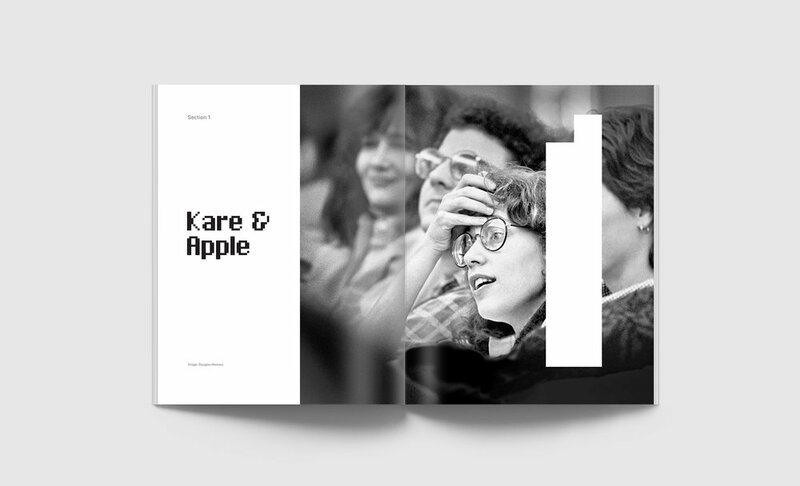 ‘Kare and Apple’ would be a section talking about how Kare started at Apple and the work she did. 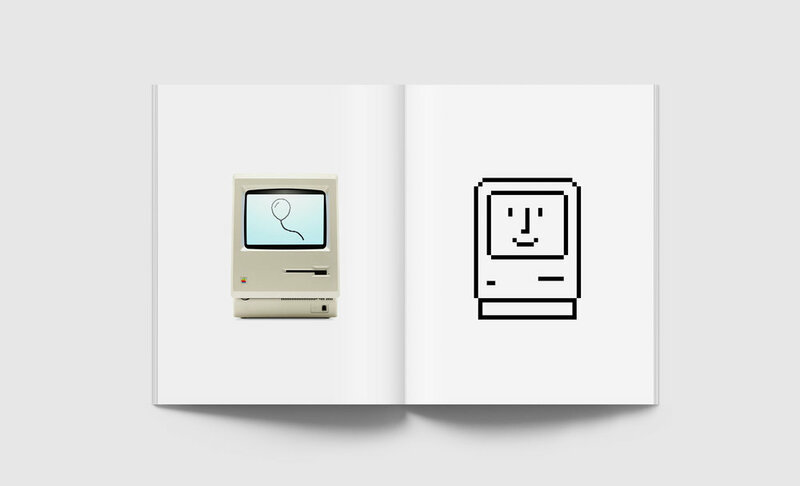 ‘The Desktop Metaphor’ would be a section talking about the Macintosh and how her icons enabled a new era of friendly computers, and how the evolution of her icons has meant traces of her work from 30 years ago are still visible on every personal computer today. The final section ‘Icon Gallery’ would showcase some of her best icons and the stories behind their creation. I then started to roughly plan the layout design for the spreads. I knew I wanted a very clean, modular and gridded structure to match the aesthetic of her icons and fonts for Apple in the 1980’s. Rough sketches when planning the structure. Moving into InDesign I created a 5 column grid structure with wider inside margins as the publication was going to be perfect bound. I had collated a selection of imagery and text to include, so I started to add it in. 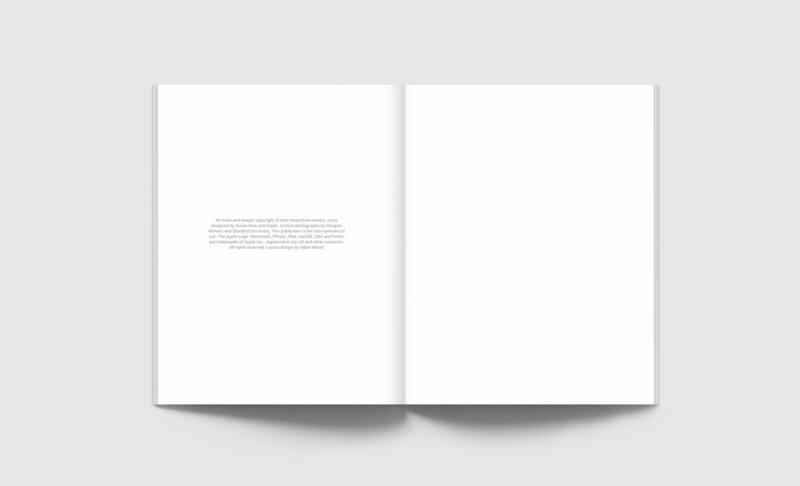 Originally I used Minion for the body text as I wanted it to read beautifully however it felt old-fashioned next to some of the imagery, and I didn’t want this to feel like a historical book, so I changed the type to the sans serif, Apple designed, San Francisco. This had more significance due to the way it complements Kare’s Chicago font, which I was using for headings. Kare’s Chicago was the original system font on the Macintosh, and San Francisco’s is the latest system font to be used on the Mac, by using these two fonts together there is a subtle historical significance paring the old and new. As I started putting content onto the spreads, some pages were looking better than others. After several hours of experimenting with layouts, I concluded that the more straightforward spreads with less content looked more premium and sophisticated. This resulted in me removing lots of material from pages with the amount of text on some pages reducing by 50%. At first, I was sceptical about removing this much content form pages, but it forced me to refine the text down to only the most important and significant stories. This led to a much more succinct and easy to read publication that flowed a lot better. Many of Kare's original icons are available in a good quality resolution online, however; there were some that were too pixelated to feature. Using perfect square shapes in Illustrator, I was able to recreate some of her icons in vector form, meaning they looked crisp and sharp in the final publication. As all of her bitmap icons were essentially different arrangements of black and white squares, recreating them was a straightforward process, and there was little room for error. It also gave me a better understanding of how she created icons, allowing me to appreciate subtle ways negative space was used. I wanted to find some strong imagery to complement type heavy pages. Images would also to feature on the divider pages between sections showing clear structure to the whole publication. There were very few photographs taken of Kare in the early Apple design team, however using an archive from Stanford University, I was able to find a concise selection of photographs taken when she was creative director Steve Jobs’ second company NeXT. These photos taken by Douglas Menuez, had a quality look the them and really captured the energy of the time. The first spread of the publication is a magnificent colour photo of Kare casually sitting in front some Macintosh computers. I love the photo because Kare was a pioneer who was about to change the world of computing but in the photo she is at work with her feet up, in casual clothes, unaware of the significance she is about to have. It really sets the tone for the whole publication and adds context to the time period. I think it was only appropriate that it opens up onto a photo of the whole publications subject, Kare herself. After a few days working hard on the layout design, I had 50 pages of stories, articles, photos and icons that really told the story behind some of Kare’s best work. The day before my print deadline I stayed late at the 24 hour Central Saint Martins Library to take advantage of their many printers and large workbenches where I could lay out my test prints. I printed my first test prints of the publication and found a lot of errors that needed changing. From small typos to icons that needed better aligning; the test prints was crucial in ensuring the final publication looked flawless. When designing on a Macbook it can be hard to visualise the true size of letters and imagery. 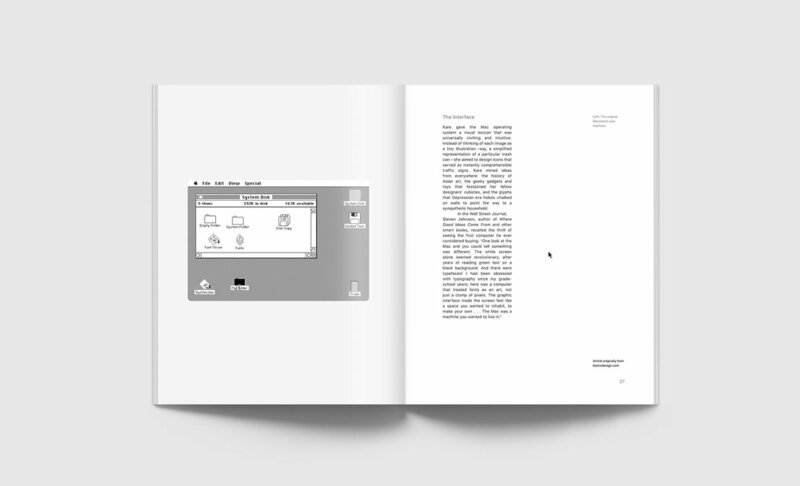 After the test print, all of the body copy was reduced by two point sizes, many icons were made bigger and colours such as light greys were tweaked to give more contrast. I printed at least three full versions of the publication before I was happy with the spreads, each version covered in annotations, notes and amendments. The day of printing, I tested out a couple of spreads to check that the printers’ printer produced the colour contrast I was expecting. It was in fact slightly different, so I went through the document making minor tweaks to light grey titles and monochrome imagery. Once I was happy, I handed over the file and had around half a day to wait while the print technicians printed, bound and trimmed my publication. I had faith that it would come out how I expected so wasn't too worried and was more excited to see my work in physical form. When I collected it, I was thrilled with the result. The paper stock, and ink quality gave the whole publication a premium finish, with some good weight to it. It felt impressive to hold, and all of the content looked crisp. All of the hard work paid off. Throughout this whole process, I learnt a lot about publication design. From planning to the technicalities of printing, to proofing work and binding methods. This is the second publication that I have worked on from the complete start to end, so I had some prior knowledge that I was able to build on. Perhaps because of this prior knowledge, I was able to approach this project with confidence as I had a clear understanding what each part of the process entailed. Although there were minor challenges, I managed to avoid significant problems by completing test prints, following a strict schedule and planning everything out in detail. It has shown me how much easier projects can be when everything is planned out (even though things don't always go accordingly). 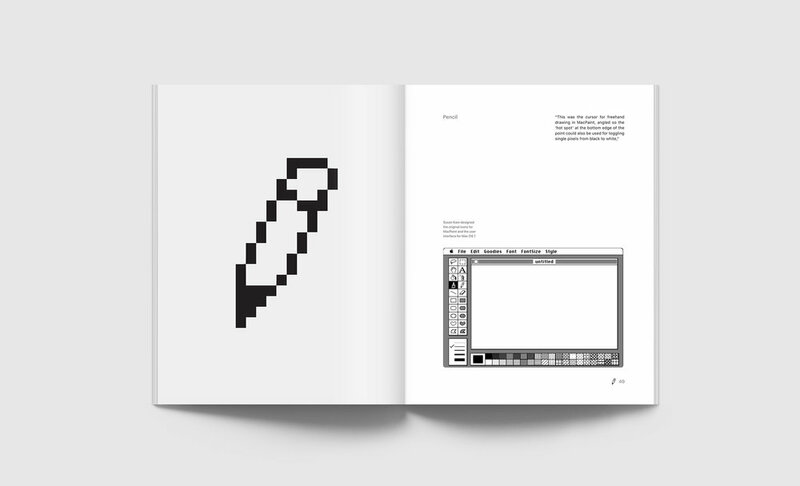 Behind the design and execution of this work, there was a meaningful purpose which was to celebrate and showcase the pioneering work of Susan Kare. Through research and a genuine love for her work, I felt her energy, ethos and attitude to design in every stage of the process. When tutors reviewed it, comments were made about how it felt like a well-executed piece of work and people were impressed with the print quality. I am extremely proud of the result and think it pays homage to the brilliant work of Kare.